This past weekend The Hyde Collection opened the exhibition Alphonse Mucha: Master of Art Nouveau which is on view through March 18, 2018. Alphonse Mucha (1860-1939) was a Czechoslovakian artist who worked in Paris and established himself as a leader of the Art Nouveau movement. Preceding Art Deco, Art Nouveau was a visual, architectural, and decorative style popular from the late 1880s until the First World War. It featured highly-stylized forms inspired by those found in nature, such as curving plants and flowers. Beautiful women with long hair and seductive looks are frequent central characters. Mucha trademarked these characteristics throughout the work which varied from advertisements, posters, and paintings to jewelry and wallpaper designs. The women were reminiscent of those found in Neoclassical paintings with long dresses that appear to be robes; flowers often form a halo around their heads. 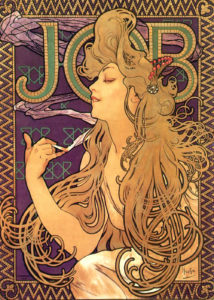 Text frequently played an important role in his poster works, such as in the 1896 color lithograph for Job cigarette paper. Here, a woman with long, sweeping hair holds a cigarette in her hand as smoke rises in a natural, curving zig zag form. 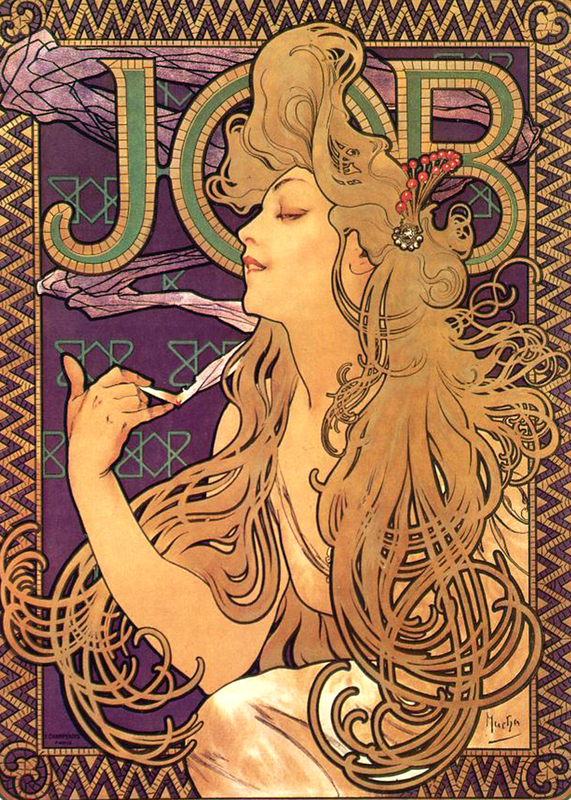 ‘JOB’ is partially hidden by the female figure’s hair which extends out of the central poster and into the border inspired by mosaic work. 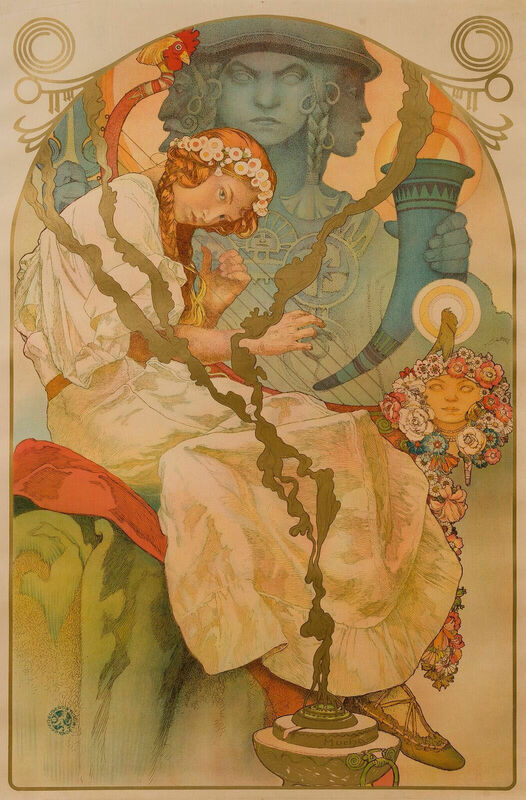 Alphonse Mucha: Master of Art Nouveau includes lithographs, drawings, books, posters, portfolios, and ephemera selected from the Dhawan Collection. It is curated by Gabriel Weisberg, Professor of Art History, University of Minnesota, Twin Cities and organized by Landau Traveling Exhibitions. It has previously traveled to other venues, including the Carnegie Arts Center in Turlock, California and the Dayton Art Institute in Dayton, Ohio. Located a half hour North of Saratoga Springs, The Hyde Collection was founded by Charlotte Pruyn Hyde in 1952 to exhibit “the permanent collection and to promote and cultivate the improvement of the fine arts.” The core collection acquired by Hyde and her husband includes works by artists such as Pablo Picasso, Sandro Botticelli,Rembrandt, and Peter Paul Rubens. There is also a modern and contemporary collection with works by artists including Sol LeWitt, Robert Rauschenberg, and Josef Albers. The Hyde Collection is a unique institution in the Capital District. They are open Sunday 12 PM – 5 PM and Tuesday-Saturday 10 AM – 5 PM. General admission is $12 and seniors are $10. It is free for members, students with ID, children under 12 and active military. To learn more about Alphonse Mucha please visit the Mucha Foundation website. To learn more about The Hyde Collection please visit their website.